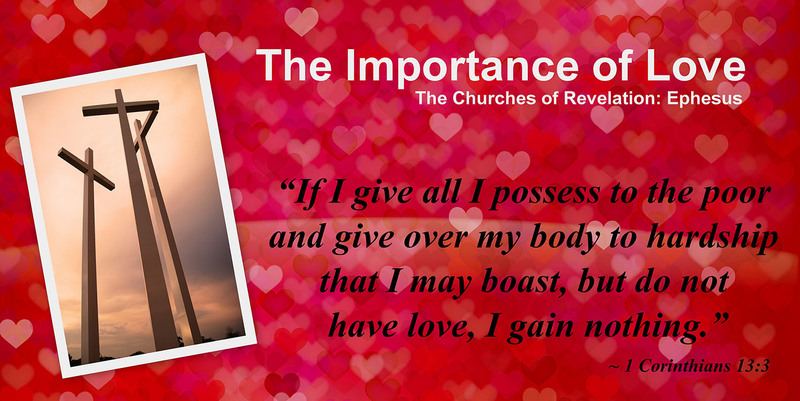 Have you ever wondered why John was called the apostle of love? When Jesus was asked about the greatest commandment he responded by telling us to love God with all of our heart, soul mind and strength. But then he continued with a second commandment to love others as ourselves. There was this idea that love was the most important thing and it is an idea that John really grabbed hold of. If you read any of the books John wrote in the Bible, you’ll quickly see that love is a constant theme and a constant thread throughout all of them. John understood the importance of loving people. And if we jump over to 1 Corinthians 13 we see this chapter on love that, John didn’t write, but that he definitely lived. And this is probably why he was given the book of Revelation because he could deliver it in such a way that it wasn’t condemning and confrontational but it was done through love. A lot of people today are pursuing the gifts of the Spirit, and that’s awesome, but really what we should be doing first is to pursue love. If we can’t love somebody, we have no right to be prophesying to them or asking to pray for their sickness or injuries. I love doing all of that stuff but the first priority has to be loving the people. Think about this, if someone stood in front of you and you were able to discern the deepest darkest sin in their life, you have to still be able to love them. That’s the level of love we all need to operate from. It’s way too easy to become judgmental and condemning and if we don’t love people well, we will never fully operate in the gifts that Holy Spirit has for us. So I just want to challenge you to learn to love first. If you want to operate in the gifts of the Spirit, that’s great, pursue that, but pursue love first. Ask God to give you his heart for people and to let you see people the way he sees them. Those are two prayers he loves to answer!